Are you looking for a showcase or counter to display products? Here at Advanced Display Systems we manufacture High Quality display solutions in our Brisbane based factory. As a Leader in the display industry with ability to manufacture on site…. The possibilities are endless! Whether your looking to create a trophy cabinet, safely secure memorabilia or creating a showcase for art works. We offer something for everyone. To discuss your next project contact our friendly team on 1800 111 477 today! 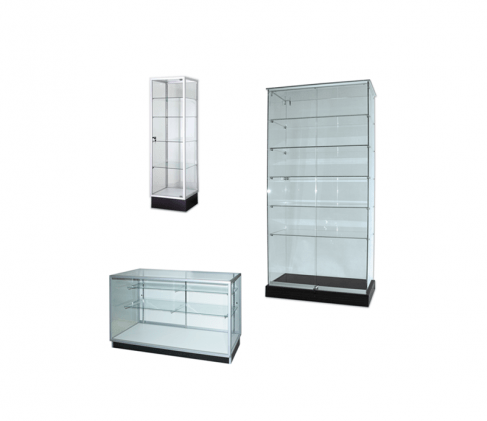 Advanced Display Systems offers a wide range of glass display cabinets for sale that will suit almost any requirement. 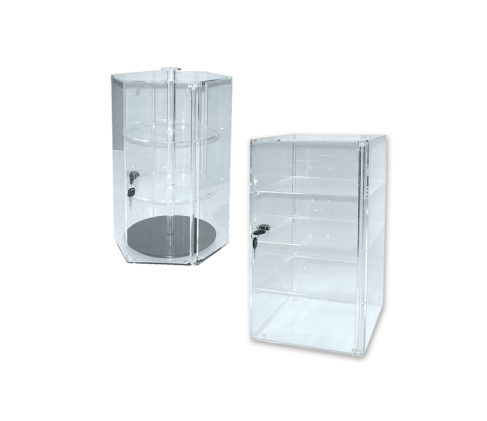 Designed for maximum display capabilities, there are Australian made styles of glass cabinets with secure storage sections and illumination for superior display of your items. Our classic series glass display cabinets offer an economical flat-pack range of stylish display towers and glass counters. Need a product showcase for your valuable stock? Contact our team for guidance on the best style of display showcase to suit your needs. We also manufacture custom sizes and styles of glass display cabinets at our Brisbane headquarters, as well as shop counters to suit individual needs. Contact us for more information. 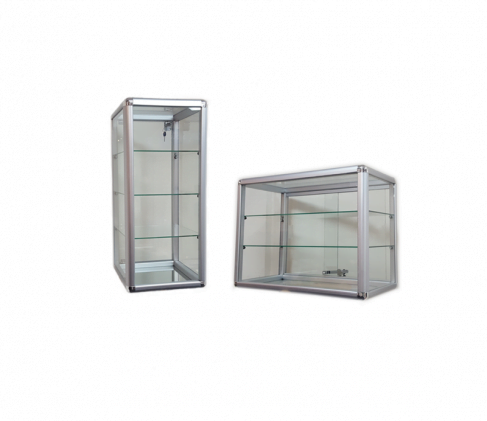 Glass showcases and display cases are one of the most secure display systems available for safe yet stylish display of valuable items. Available with a wide range of options, there is a solution for your every display requirement. Advanced Display Systems manufactures jewellery display cases and jewellery display cabinets with high quality key locks for peace of mind, along with a strong framing system and sturdy base, giving you a long lasting investment made with guaranteed quality workmanship. Adjustable shelving options are standard with every glass cabinet, designed for differing sized articles such as ring displays, watch displays and much more. Memorabilia display cases and trophy display cabinets are popular for educational and sporting venues. Display medals and trophies in glass towers for 360 degree viewing and choose an illuminated style for superior lighting of your display. Need the display cabinet to match your theme or logo? We can make custom glass showcases and counters to suit colour and style requirements using coloured infill panels and powder coated framing. Retail display cabinets facilitate the option of all glass sides or a slatted infill panel at the back giving you the option of shelving and hangsell opportunities using our wide range of slatted wall accessories such as hooks and sloping arms. We work with shopfitters and builders to provide a complete showcase package for project requirements, contact us for more information. 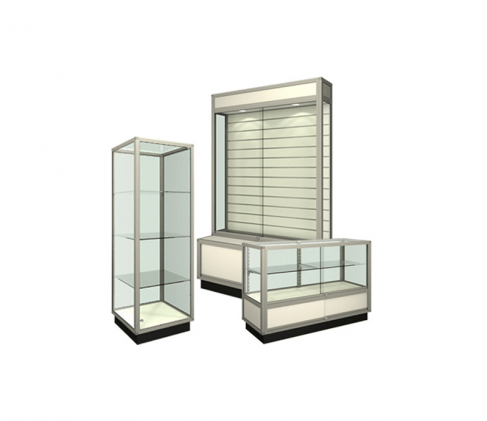 Our range of display cabinets also includes wall display cases for areas where floor space is limited. Mounted to the wall using a secure bracket system, these cases are also popular for schools and areas where small children are present. Keeping the glass display case off the floor then minimises risk of damage and also facilitates easy cleaning underneath. View our applications for inspiration on custom glass showcases and counters, including endless styles and options.